Eilidh Child will leave everything on the track in Beijing this afternoon. All she can do is hope it is enough to secure a world championship medal. The European champion grabbed a spot in the 400m hurdles final by the skin of her teeth after qualifying from the semis as a fastest loser on Monday. 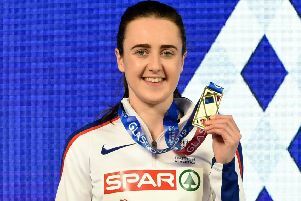 Reaching the podium would be a huge ask for the Scottish record-holder who has struggled with technical adjustments but, even with the relay still to come this weekend, Child has nothing to lose. Meanwhile, Steph Twell’s career will travel full circle when she walks back into the Bird’s Nest for tonight’s 5000m heats, seven years after she was a shock selection for the 2008 Olympics in her teens. The now 26-year-old missed London 2012 with a broken ankle and then reconstructed herself to return to the peaks of her youthful pomp. Chris O’Hare believes landing two European medals inside the past year will give him the edge he needs to produce a surprise challenge for the 1500m crown. The 24-year-old – who was 12th in Moscow two years ago – rebounded from a series of niggles to lower his personal best to 3:34.83 in Belgium five weeks ago but has prepared himself to seek an extra gear.